Bali Surfing Pro Surf is located in front of Kuta Beach and suponsored by popular surf brand "BILLABONG". It face to the famous tourists spot, Kuta Beach. They have complete facilities, so beginners feel easier to start surfing. Sponsored by BILLABONG, popular surf school! Good facility, office is in the hotel! Instructors can speak English and Japanese! Talk with instructor and lesson in your level! The point is very close from beach! Go to shopping after lesson! You can go to Legian street by walk! Odysseys Surf School provides 3 courses for Experience Surfing; Total Private (1 instructor for 1 student), Semi Private (1 instructor for 2 students) and Group (1 instructor for 3 students). For children age under 14, if booking to Group Lesson, 1 instructor teach for 2 students. Moreover, their courses have different level Beginner - Intermediate 1, 2, 3. After you go there and meet with an instructor, you can choose the level depend on your experience. It is suitable for students with no or little surfing experience. 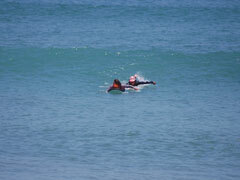 The course covers basic skills of surfing. Board handling, paddling and perfecting jump up. Also, learn safety surfing. It is suitable for students who have some experience and able to catch small waves. The course forcus on effective board control, paddle out, choosing wave, principals of timing and take off, and basic front and backside turns. It is suitable for those who surf, 1-2 years experience, and want to skill up. Refine basic skills through video analysis of students surfing. Coaching is tailored to open face surfing; refining take off, generating speed, climb & drop the waves face, developing forehand, backhand turns, etc. It is suitable for experienced surfers who want to reef surf and more developing skills. Understand the surf zone & reef environment, enter point, exit point, current flow, and reading waves. The length of lesson is 2.5 hours for Group Lesson and 2 hours for Private and Semi Private Lesson. Pro Surf changes school schedule / pick-up time everyday because they offer lessons in best tide on the day. You cannot change the lesson time, please understand it. *1 You need to put deposit money Rp.200,000 for incase lost key. The deposit money will return when you return locker key. Yes, you can. Guest's accompanies can use transport car for free. (except high season) Also, you can use facilities in the office for free. Yes. We are located near shopping area, so you can go there by walk. If it is in Kuta area, we can drop-off to your request place. * Max. 7 people can ride on one car. * Your accompany is also available to ride for free. For peak season, extra charge of Rp.50,000/person (return) is needed. *Start time will be changed everyday depend on tide condition. I really wanted to experience surfing since before. I`ll be popular among girls if I can surfing! That`s why everyone men joined surfing. LOL We learned from basic surfing, and training on the beach. I wanted to stand on the surfboard, if I can do it I think I`ll go to the next step.